Professional psychic Iacuzzo convincingly messes with the time-space continuum in her memoir of life in a dysfunctional family of clairvoyants. 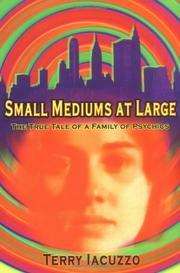 Like her brother Frank, who went on to become a renowned psychic, the author had visions from an early age. She could moderate their steady flow (“I can choose to look away if I want to,” she later explained to a client), but she hadn’t a clue what they were all about. In addition to being terrified of her powers, young Terry was also afraid of her unpredictable mother. That may account for the quirky, shy, matter-of-fact menace of her book’s tone. It’s nothing, in Iacuzzo’s account, to spend day after day tripping on acid or wandering through the seamiest parts of New York City. She’s already seen it all while learning to steel herself against the parapsychological onslaught. Her story has the ring of authenticity, because Iacuzzo describes exactly what she experiences. Watching Lee Harvey Oswald get shot as a teenager, she writes, brought her abilities into focus: “A murder, an altering of life miles away, this real-life event as it was happening on a black-and-white television screen, showed me how my brain and my body worked. It gave me a way into my own visions . . . it was at this moment that I understood the power of my ability to direct myself to a specific place in time.” When she could call her visions into specific focus, she could “watch the future.” It wasn’t easy, though she had a knack for interpretation: once, seeing a vision of a woman rocking her empty arms, she realized that the client before her had just undergone an abortion. Apparently, she had some previous practice; other psychics told her that in an earlier life she was a magician and a priestess. Iacuzzo continues to work in New York City today. A chilling treat for those who believe the universe contains more than meets the eye.